Note: Although he’s one of the wine world’s great talkers, Ulrich ("Ulli") Stein of Weingut Stein knows that words alone will not be enough to confront the economic and spiritual crises currently—and urgently—threatening the great traditions of Mosel winemaking (including sites such as St. Aldegunder Palmberg-Terrassen, pictured to the left). Below is a call to action from Ulli, already generating significant response in the region, here translated in full. Viticulture on the Mosel has already experienced plenty of crises—and survived! But the ultimate endgame now threatens those old Riesling vines in the greatest steep slate slopes throughout our region. While, on the one hand, thousands of euros are spent at wine auctions for a single bottle of Mosel Riesling, and though for many growers who market their own wines all is well, the price for 1,000 liters of Riesling (in Fuder) now sits at 600 euros. Many part-time grape growers, who have long worked age-old vineyards of extreme steepness and scenic beauty, are finally giving up. The reasons are not only economic but also psychological: if the oft-mentioned “heroic” work in the steepest vineyards not only fails to generate profit but also engenders massive losses, then that signals, in the end, an extremely low regard not only for the work but also for the people engaged in it. In the past, too many Weinkellereien have placed too little value on quality, have bought and sold junk (as long as the price is low! ), and have led the names “Riesling” and “Mosel” into the bargain bins of supermarket shelves, from which they can no longer escape. Many winemakers have fashioned their wines accordingly, accepted any price, shared their frustrations above all with their children, in word and deed emphatically warning them against the life of a winegrower. Consultants and lawmakers have fixated single-mindedly on sugar content as the exclusive criteria for quality; propagated the “wrong” varieties (like Kerner); and encouraged questionable winemaking methods (sweet reserve, de-acidification). And at the end of the day, roughly 90 percent of all consumers refuse to pay more than 2.99 euros for a bottle of wine, regardless of whether the label indicates Riesling from steep slopes or Pinot Grigio from the Po Valley. This all sounds rather pessimistic, though sadly with good reason. Half of all vines in my village of St. Aldegund will be cut down and grubbed up in the coming months, and in the next two years it will be another quarter. A similar fate awaits the neighboring villages (Alf, Bullay, Neef). Most of those winemakers who are still active are over 60 years old, and for many there is no successor in sight. 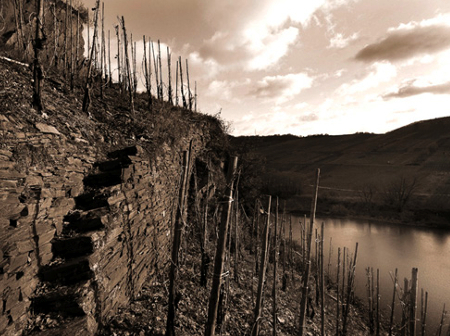 Soon the 2,000-year-old viticultural landscape will cease to exist in many places along the Mosel. Whether the oft-mentioned tourists will still come to gaze upon blackberry bushes remains to be seen. Faced with an offer of 60 cents per liter of Riesling, bulk grape growers should consider simply refusing to sell. Not for that price! Come what may! Hold out! Maintain a measure of self-respect! In-house and intra-estate reorganization (in the case of older winemakers of declining strength) in which lesser sites are relinquished in favor of those steep slopes that define the Mosel landscape and are responsible for the reputation of its wines. The quality of wine produced by those estates that sell and market their own wines must be improved through simple, cost-friendly measures, among them a more selective and—as a rule—later harvest, lower yields, little or no fertilizer, controlled fermentation, and so on. At the same time, the value—now also reflected in the glass!—of these steep-slope Rieslings must result in higher prices. There can be no more 3-euro Riesling Spätlese from famed steep sites (like Bremmer Calmont), no more high-quality producers consistently undercutting each other’s prices. Winemakers can and must develop more courage and self-confidence; stand more firmly behind their product; demand from customers an appropriate price for quality; and not tell themselves “I’ll never be able to do that” without ever having tried. All winemakers and non-winemakers, including those who rent rooms to tourists, hotel and restaurant proprietors, and other affiliated businesspeople should place more value on the importance of the steep slopes and embrace and communicate that value accordingly. Finally, all involved should treat each other with less envy and spite and instead aim toward solidarity and tolerance. Translated by Dan Melia, with assistance from David Schildknecht, and first published on the blog of the former Mosel Wine Merchant, January 11, 2010.